Hey guys! Thanks for checking this out. 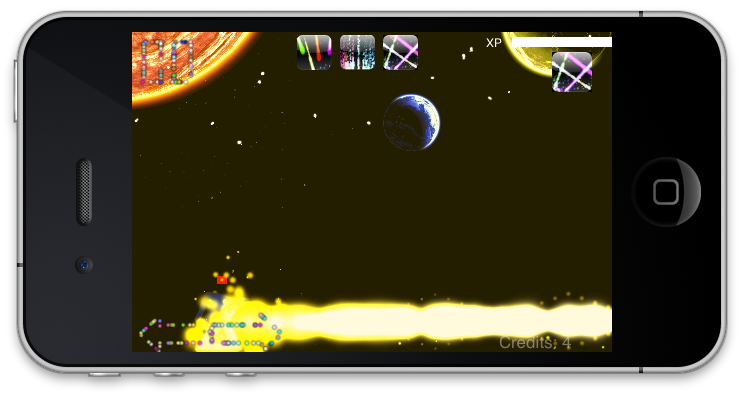 Particle Boy is my first ever iOS game. Ive been working on it for 3 months now, and I hope to finish it in early september before my senior year at Stony Brook University takes over my life. The stuff thats done so far is 4 weapons. A fireball, a meteor, a "bouncer", and a beam. Each one has 7 different evolutions and is evolved over time by killing a certain amount of enemies. The game is a sidescroller. You simply move left,right and shoot, ocasionaly changing your weapon. There are also 3 long lasting spells. Each spell last a few minutes and is linked with a song and a weapon. There is a long lasting spell for the meteors, the beam, and the "bouncers". Spells have cooldown rates of 12 minutes and they are very powerful. There are alos 3 different background themes that can occur. The first is "The Starry Night". It has fireflies moving around on the bottom with stars and shooting stars up top. I still want to get the stars scrolling with he player. The second is a Rain/Thunderstrom. And the third is a Firework celebration, I still want to get the fireworks to scroll with the player. I also still need music for each of these background themes. Add music - for the different long lasting spells and themes that occur. Thank you to everyone that has allowed me to use thier artwork and music. You guys are awsome at what you do and I hope one day I can be awsome at what I do :D You guys are very inspirational and I really mean that, thank you. I want to take some time to talk about my last project. Solar Snake is supposed to represent the human train of thought. Specifically mine I guess :D And the "Terrible Teleporter" (The world Solar Snake moves around in) Is the human mind. At the beginning of the game you see Solar Snake get sucked in to the Terrible Teleporter and for the rest of the game he tries to find a way out. But of course he never does. Each level was inspired by something I would randomly think about, for example. Theres a pacman level, a candy land inspired level, a Towers of Hanoi level, an artpad inspired level of a picture I loved. You get the point :D All things that randomly popped into my head while making the game. The snake teleports from one level to another. The game is meant to be very confusing :D As I feel thats how the brain is. He was in my very poorly programmed video game Collision which I sadly found out doesnt work on a majority of the Android devices. Anyway I thaught I would take some time to introduce you guys to Solar Snake so you knew what he was when you saw him in the game. I just made 3 videos showing the above artwork and music in Particle Boy. Each weapon has a level up effect that uses alot of particles. I made each gun go from level 1 to 7 in a single kill so were dealing with 7 times the normal amount of particles at certain parts :D. This is why the fire freaks out in the beginning as well. But yeah let me know what you guys think about the songs and there themes/background particle effects I have chosen/made to go along with them. Triangle boy hates particle boy. They get in a fight, triangle wins. On the opening screen it says "art and music by Opengameart.org"; you should probably say 'from' rather than 'by,' since OGA is a venue for (and occasional commissioner of) work, rather than a producer. Sorlo's sprite appears to be crunched together horizontally, which looks kind of odd. Is that a preview thing or is there some other reason? Thanks Redshrike I'll change it to say from. Originally it said by because all my Music was coming from one person, but then I stumbled upon OGA <3. Thanks for pointing that out. Ill look into Sorlo thanks for pointing out. And WOOOO! Your the first person to post on this thing besides me :D Thank you! WOW Thank you Redshrike! I originally used a rectangle that was 34x64 for my main player. I never changed its with and height to meet Sorlos! Thank you so much, I knew something was off but I didnt know what. Don't know if its worth mentioning on here but Particle Boy is a dream. There is someone called "Potato Kid", in his dreams he is Particle Boy. Potato Kid is another character and video game I thoroughly thought out but requires much more artwork and experience to make. It will be the next video game I work on though. Anyway Potato Kid has no powers, but dreams he does. He fights off enemies with a toy Potato Gun, then eventually other toy weapons are unlocked (I don't want to write too much here). Anyway when bad things start happening he ventures out with his toy weapons, in the face of death he aquires powers similar to those in Particle Boy (AKA: The powers he has in his dreams) and kicks major BUT! Someone please help me make all this come a reality for me by helping me kickstart my very first iOS game by animating Particle Boy! The visuals remind me of Scoregasm. Just finally made it so the player can die! Just in case anyone is following this. The game has been severley updated today. I was lacking deaths/ammo, game over screen (That worked), starting a new game at free will. And now I have most of all that stuff working except ammo. Thats next, and I still have to fine tune some stuff with using lives and continuing the game because I would like to get in-app purchases for people to buy more than the given lives if they really want to keep going for the high score or something. I wasted several hours trying to get in app-purchasing to work. It was very fustrating and I didnt make much progress exceopt for maybe familiarizing myself with the whole app store distribution process. I'm going to give up for now and focus on adding more enemies. I wll attempt the in-app purchasing again later in the development when im not so fustrated. Apparently this is actually a well known P.I.A. task. So when I figure it out I plan on making a youtube tutorial on how to do it. Since you're going particles ahoy, and you want to keep it simple what about, a smoky background, and you make it change depending the scene? You could compliment it with some simple shapes. maybe mixed with some simple backgrounds, for example (old screenshot from a project of mine, but illustrative enough) which is a few palm silouethes mixed with some quick drawn mountains and a tower/castle one. Really awsome idea. I like the idea of having a non-moving castle in the far distance as well as other objects. I can have the stars and fireworks render behind that since theyre supposed to be really far away. I could get a fog image, and slowly move it across the castle in the bckground, maybe even find a moonand have rolling fog/clouds over that as well. If anyone knows of any OGA entries for a castle, moon, and fog. Let me know! Fog, you should be able to do it with particles, dig a bit on the death effect you have. Moon CC-by too: And maybe you can use that light post too. As for using particle for fog. I'm actually in the process of calming down the number of particles used so the game runs faster. I hope it's allowed but. Thank you so much PolCPP! All new main character is done!!! Animations for running, sliding to stop, idle, shooting fireball, shooting meteors, shooting bouncers, and shooting and charging a beam!!!!! There's something that bothers me, not sure how i haven't realised earlier, since there's no close background the character/enemies don't feel like they're moving on the map but kinda giving a treadmill effect. I hear you PolCPP and thanks for the response. I'm trying to come up with ideas for scrolling foreground stuff. I'm probably going to use a fog of some sort. What do you think. If you think of anything let me know! I also added "Specials" for each of the 4 powers. Once the SP bar fills, you can unleash a devastating Special attack! Thanks for keeping updates going on this. As a non-developer, it's cool to sort of see the process in action. Anyway, looking great so far! May I ask where you got those graphics? And if they are yours could I use them because they seem like just what I'm looking for! And I'm really glad your enjoying watching the progress :D That's the idea of this thread anyway :D If you ever have any questions let me know! fir3st0rm9, which graphics are you talking about? And the "special effects". Like explosions, fireballs, meteors, etc.... Those were created with a Particle System Editor I spent a semester developing. If your intersted in learning about iOS development, Particle Systems, or OpenGL let me know. I can point out some really good books I read that taught me almost everything I know. Anyway I also have some news on the artwork. The enemies are being replaced :D Thanks to Tokka! There are also going to be some cool scrolling background images soon thanks to Tokka as well. Anyway the game is really getting there and I can hardly believe it! Thank you to everyone at OGA, your constant feedback is much apreciated and I couldn't have done any of this without you guys. No no its okay, I was referring to PolCCP's graphics. I do however like your project and I think is has good potential! Actually that character is for a Phantasy Star online based platformer style chatbox (the one in there was a Ramar), sprites will contain walking and standing stances. Atm my artist doesn't have the pso chars completed (missing 6 walking class sprites). -The ammo system is in place and working perfectly, you now can actually purchase, upgrade, and buy ammo for our powers in the in game store. -I added alot of code that now alows the game to be persistent once turned off. Meaning the app can be turned fully off and you can resume your game where you left off. It's getting there everyone :D I hope to be finished by the end of this month!! Please leave feedback! FEEDBACK FEEDBACK FEEDBACK!!!! Added a new ridiculous and unexplainable effect!!! 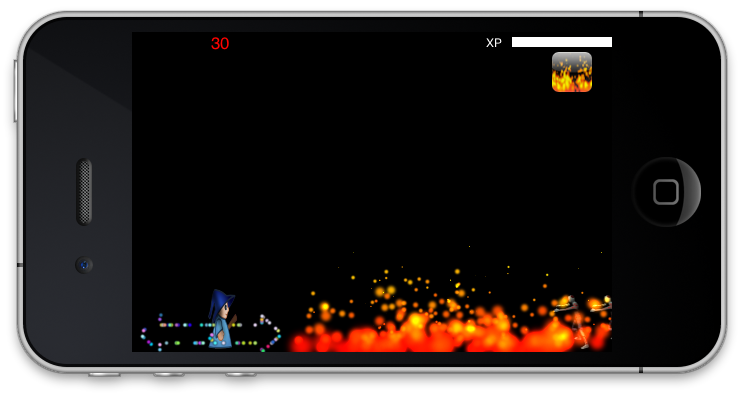 The idea of the blue flames is every once and a while the player will walk into one. When this happens the player can sit for up to a duration of about a minute. If they wish to get right back in the action they can simply tap the screen. At the end of this either blue fireballs, meteors, bouncers or beams will drop from the sky. Then the player may or may not get ammo of the chosen weapon. :D Check out the newest "Particle Music Video"
Let me hear some feedback guys! Sorry to be MIA for so long. I've recently made alot of updates to Particle Boy. I added In App Purchases!!!! YAY, it was a PIA! I am now in the process of adding a sponsors page where people can donate money, upload a description, a website URL, and a photo. All sponsors will be displayed in UITableView, once a sponsor is cliked the player will earn some cash (only happens once per sponsor, or until the sponsor pays more money) and then safari opens up to the provided URL. once it is up and running I will upload a video to youube. I'm alos going to be adding an automated monthly tournament. The player who has the highest score by the end of the month gets to upload a URL, description, name, and Picture of themselves. They will then be displayed as "This Months Tournament Winner" on the main home screen. The main screen will also display the current player thats ahead for the current month. I already added in a "Submit score to leaderboards function" at the game over screen. The game is really coming along. I just need to add this sponsors page, spice up the leaderboards page, and make the Tournament thing on the main screen. Thank you. And I will be writing here again shortly! If anyone has ideas about new spells/powers for Particle Boy let me know! I'm currently looking to add 3 more spells to the game, each having 7 evolustions! Totalling 21 more spells!!!! I am currently in the process of adding a Hologram Spell to the game! But please please please send me some ideas! If any ones spell gets put into the game you will defidently be mentioned in the credits! I've noticed that a few of the files you are using are licensed as GPL v3 or CC-BY-SA 3, which will require you to release the source code for your game, as mentioned in the FAQ. Since the Apple Store licence prohibits GPL-like licences from being used, I think that you'll have to remove them from your project. See the VLC story for reference.